Released on the 27th of July, Sound of the Police is a mix album Cut Chemist put together in preparation of opening for legendary Jazz musician Mulatu Astatke last year. 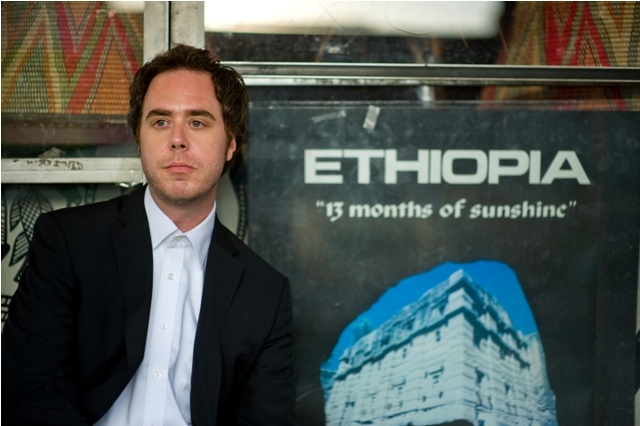 Emphasizing Ethiopian and Afro-Brazillian influences, Cut Chemist wanted to show his chops as a DJ by using only a single turntable, mixer, and loop pedal along with his deep crates of wax during the set. What follows is a brief conversation I had with the man himself on the day his album dropped. I understand Sound of the Police grew out of a live set you’d only planned to do once, as an opener for Mulatu Astatke, and the Ethiopian influence is very clear on many of the tracks; have you spent time traveling in Ethiopia? Or in South America? Ironically I’ve never been to Africa, but that’s probably why I’ve got such an appreciation for it. I feel like I have to do as much research as I can to get close to it. I’ve been to South America a number of times and did a lot of research and record digging down there, even worked with a few musicians. I had a great time and loved the culture, especially Brazil, where I had a lot of fun. But not to Africa. More broadly, what influenced you in sample selection for the mix? I get a lot of inspiration of African music through friends of mine that have been there. Ethiopia specifically inspired me years ago, just because I never really heard anything like it; the chord structures particularly. It was so isolated from anything else musically that I’d ever experienced. So, I got really into it around 1994. [At that time] It just seemed really difficult to get a hold of that kind of music. It was like, this music seems really rare alongside of being really good. I became fascinated with how I could get my hands on this stuff. So I always kept my ears open for anybody else with a like mind, which is how I met Quantic, Will Holland, and [DJ] Miles Cleret who both made a lot of trips over to Ethiopia and brought a lot of stuff back. So they’ve put out comps together and Miles Cleret owns the label Soundwave and he does a lot of interesting compilations of African stuff, and South American stuff. What, if anything, is the album’s name a reference to? Is there a special meaning behind it? The title comes from Ethiopia, as their bands were mostly military personnel. A lot of Ethiopian records will say ‘Bodyguard Band’ or ‘Army Band’ on them. So I thought it was a clever title. Also it illustrates what Ethiopian music generated later, that’s why I included stuff like Incredible Bongo Band and INI. I thought it was important to kinda say, ‘Hey everybody, African music still is important and it should be on the radar’. Things are heating up African music wise, there’s a lot more compilations and it seems like there’s a lot more attention right now. You know this set happened a year and a half ago, so I thought if I’m ever going to put this out, I should do it now. Sorta strike while the iron is hot. In your near-future live shows, are you planning on making selections from the mix part of your set? I hope so. I’m doing a couple of shows in the near future, though not exclusively Sound of the Police. They’ll be more of an audio/visual thing. But in the near future I want people to see this performed because it’s kind of interesting to see just one turntable and a loop pedal. Shifting to a bit more of a reflective mood, you’ve been creating as a DJ for many years now; do you feel like a mainstream appetite has consistently grown year after year for DJs? Do you have the feeling that there’s still a much larger audience to reach? Yeah it’s certainly grown, because everybody who now has software programs can be a DJ and is. So it kinda makes it harder for people who have been doing it for a long time like me to be unique. It’s like ‘oh he’s just a DJ, just like me. I play music at a bar down the street, so who cares?’ I actually get that, even from people close to me who DJ at a bar who say ‘Well what you do isn’t special, I do what you do.’ It’s a blanket excuse for fans to sorta say ‘Well I don’t need to see him because there’s so many DJs now.’ So you have to push the envelope, so that’s why I did what I did with one turntable, a loop pedal and all vinyl [on Sound of the Police]. Just to be like ‘Okay, look, if you guys think you can really do what I do and if I’m being categorized with every typical DJ out today, I have to keep doing things to try and set me apart from that’ to show I am an artist and something more than just somebody who plays records or music. It forces me to kind of go out of the box and do something unique, which I like, and the more and more it becomes mainstream, the more and more I have to do that. So it’s fair to say your own style has morphed over the years because of this saturation? It has to, but it goes both ways. In some ways I’ll go further outside of the box but I’ll also be musically accepting of some kind of mass audience. I’ll be like “I can beat juggle Blur, I can beat juggle this or that and show you what you are familiar with’ which can be a lot of fun and challenging. I went down to Mississippi and did an all dirty South set which was a lot of fun. Is there now a broader consciousness on international music and how it relates to U.S. hip-hop? I think there is a lot of interest, especially with people like Diplo and Major Lazer. They’re dipping into reggaeton, African stuff, and Jamaican stuff. They’ve kinda always been doing that. Their textures are almost third-world electronic, kinda hybrid. That’s really popular, obviously, and people are getting into it through them. For me, it’ll always be Ozomotli and I think that’s helped branch a lot of people out to different things. It’s certainly the reason why I got into Latin music. I wasn’t into Latin music; I was into Hip-Hop and Soul until I got into that band. Then we started experimenting with a bunch of different rhythms and African stuff and I was like ‘oh, I should check some of this stuff out.’ Then I started putting the puzzle together with hip-hop and Fela. I think everybody kinda does that and everybody wants to be more knowledgeable about music; no matter how much you’re into it. So the further back you go, you’re going to find yourself in Africa, eventually. In my research I came upon DJ Dusk’s Root Down Sound Clash from 2007 and it was amazing to see so much talent from LA. Broadly, how do you feel the LA underground hip-hop scene has developed in the last decade? I think it’s great. I like how LA seems to generate a scene. In the early nineties it was the Good Life, which spawned people like Freestyle Fellowship and Jurassic 5. It was like a chain and it still reverberates out, people are still talking about that scene. Now I think you have the Low End Theory scene, which is Flying Lotus, Gaslamp Killer, DJ Nobody and Daddy Kev. It’s a really strong presence and it’s kinda overtaking the LA underground scene, certainly with Flying Lotus’ success, and it’s not just one guy, it’s the whole crew and it’s the scene. It’s very electronic and button pushing; you know frequency sonic. It’s not so much like turntablism or MC focused, it’s more like an electronic production scene. I’ve never really known that to happen on such a big scale until Low End Theory, so I’m proud of that. Do you feel like there are any new and upcoming acts that are strictly turntable based these days or is it all spliced with digital elements? Turntablism kinda died in like 2000. The scene was so heavy, but it seemed like it had no chance but to fizzle out. You still have people that are doing it, who were doing it, but not as many people are interested in it. Probably because of the idea that ‘anybody can be a DJ so why go see this guy when I can just DJ in my bedroom, where I’m the king’. That kinda helped kill it. But I also think those DJs also had to force themselves to be productive and change into a more mass accepted entity rather than just a turntablist. You have people like DJ 8 Track going into electronic indie stuff, you know the world’s première turntablist. He said ‘Okay, I’m gonna try a new avenue here’ and then there’s other people that went straight into production; making music, writing music. It forced everybody to grow. Returning to your latest project, does Sound of the Police preface influences we’ll see in your forth-coming full length? That is a good question. I don’t have a very good answer. I don’t know, I kinda feel like this [Sound of the Police] is my worldly homage, but I’m kinda rethinking. Maybe I can implement something, because my new album is a lot more electronic, a lot more ‘everything but African’. There’s gotta be a way to bridge the gap because I think that would be a good look and I know if I was a fan of myself I would wanna hear that. It’s like ‘Okay, you’re taking us on a journey here and don’t abandon us’ and you do need a theme to your album. I don’t wanna come with like heavy metal and have everybody be ‘what the hell is all this? It was hard enough for us to accept the Ethiopian stuff and now you’re gonna flip the script again? We want “The Garden,” man’. Are there any artists that you’re hoping to work with for your next project that you can tell us about? I’m working with Edan and Mr. Lif again. I’m working with Hymnal again. I’m working with a guy named Black Bird who’s a local MC. I wanna work with some other people, but I don’t know who yet. On a more personal note, how many and which instruments do you actually play? Do I have to play them well? Ha ha. I can play guitar, drums, piano and various percussion instruments. In Ozomotli I had some pretty wicked bongo solos. Our readers are predominately New York based, so I was hoping you might clue us in to a favorite spot you enjoy checking out when you’re in town. I used to go to NYC a lot, but it’s been a long time. The one thing I usually do is go record shopping at Academy.